Who doesn't love free shipping? We're offering free shipping on every order $30* or more placed between Thanksgiving Day, Nov 26 and Sunday, Nov 30. I've always had a special love for holidays and parties and all the baking that goes with them. And I do love me some kitsch. So it was a natural fit to add another shop to my small but growing empire. Check out our newest shop: Sweet Estelle's Baking Supply. We have all the kitschy goodness you could ever want in your baking decorations in one convenient online location. Cupcake sets, cookie cutters, cupcake liners, picks + toppers, edible sugar decorations, and more. Stop by and say hi! We're getting ready for the holidays! 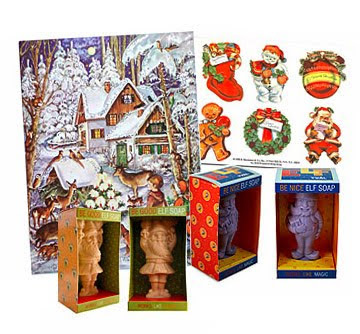 Check out our wonderful glitter covered advent calendars, our retro Christmas stickers and our cute Swedish elf soaps. Looking for kitschy, fun stocking stuffers? We have a bunch of those too. There's something for everyone on your list here at ALL-POP. Shop early, shop often!